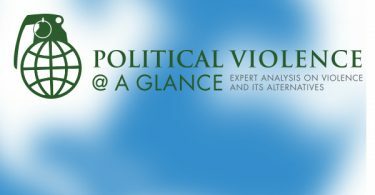 I’m tickled pink to have my research with Reyko Huang discussed by Erica Chenoweth in one of the first posts on Political Violence @ a Glance – thanks Erica! But here’s the thing, I don’t think our research says what she says it says. But our research doesn’t support that conclusion for two reasons: 1) our research is on democratization after civil wars, not after the types of mass uprisings that characterize the Arab Spring; and 2) while we find that aspects of the war, such as its outcome, don’t affect the prospects for democracy much, that’s different from saying the fact of the conflict as a whole will have no effect. I actually think the Arab Spring probably will lead to at least some democratization in at least some parts of the Mideast and North Africa. Allow me to elaborate. The first reason our research doesn’t lead to the “no democratization” conclusion is that we look at democratization after civil wars, which are not the same as the popular uprisings that have characterized most of the Arab Spring. Our research applies to the prospects for democracy in Libya, where the uprisings at the beginning turned into a civil war, and probably in Syria, where things seem headed in that direction if they’re not there already (see Barbara F. Walter’s post on this); but not in Tunisia, Egypt, Jordan, or most of the other countries that have been affected by the wave of popular protests that have swept the region. The dynamics of armed rebellion and insurgency are very different from those of mass demonstrations. So extending our research to these cases isn’t just extending them “out of sample” but to a different kettle of fish. And for reasons I’ll come back to below, there are good reasons to think that mass uprisings are (even) better for democracy than are civil wars. Determining whether civil wars are “hiccups,” “catalysts,” or “inhibitors” on the road to democracy would require comparing democratization in countries that experience civil wars with those that don’t, something we don’t do. Rather we look only at states that emerge from civil war and ask why some democratize while others don’t. A rather different question. For what it’s worth, we find that an awful lot of states emerging from civil wars do democratize, which suggests that civil war is often a catalyst for democracy. It shakes up entrenched systems, and in a region as autocratic as the Middle East, my guess is that such upheaval is bound to nudge societies closer to democracy. But that’s my guess, not something I’ve done concrete research to support. So it’s true that we find that the kinds of things that tend to foster democratization in other settings, like economic development and not having too much oil, are the best predictors of democratization after civil war. And it’s true that we find that attributes of the war itself, particularly its outcome – who wins or whether there’s a negotiated settlement – have surprisingly little effect on which states emerging from civil war will democratize. (One might think that negotiated settlements between warring sides might lead to more inclusive and democratic politics, but that turns out not to be so.) But that is different from saying the war as a whole doesn’t affect democratization. That is, having experienced civil war might lead countries to democratize, even if it doesn’t matter much how that war ends. So what can we conclude about the effect of the Arab Spring on democracy? If we wanted to apply the implications of our research not just to post-civil war cases but also to societies emerging from other types of conflicts (which is a stretch, so this should be taken with a big ol’ grain of salt), we might predict that of those Middle Eastern countries experiencing the upheavals of the Arab Spring, the ones most likely to end up moving toward democracy are those where economic and other factors tend to promote democratization. That is, the oil rich states are less likely to democratize, and of those not blessed/cursed with oil, the relatively more economically developed countries will have an easier time moving toward democracy than their poorer neighbors. So states like Tunisia and Jordan (little or no oil exports, relatively high GDP) have better democracy prospects than those like Libya or Yemen (high dependence on oil exports and low GDP). There are also several reasons to think that the Arab Spring as a whole will lead to democratization precisely because it has not consisted primarily of civil wars, but rather of mass-based peaceful protest (even if this has been met with violence by the state). My co-author, Reyko Huang’s recently completed dissertation shows convincingly that the more rebels rely on civilians, the more likely is democratization after civil war. Mass uprisings by definition rely on mobilizing large segments of society. So to the extent we can extrapolate from civil wars to mass protests (again, this is more than just “out of sample” extrapolation, so keep your salt shaker handy), my strong suspicion is that the uprisings of the Arab Spring will be more likely to lead to democratization in the long run than would revolutions that rely on armed insurgency, and that therefore mobilize narrower segments of the population. Interestingly, in Huang’s research this pattern holds true even if the rebels lose the war. It’s not that more democratically minded rebels mobilize civilians, and if they win they implement democracy. It’s that the process of mobilizing people raises their expectations, and makes post-war elites (whether they be victorious rebels, the incumbent regime, or some power-sharing mix of the two) more accountable to the public. Erica Chenoweth’s own research shows that non-violent protest can be more effective in achieving demands (in this case for democracy) than violence. So will the Arab Spring democratize the Middle East? Maybe not, and almost certainly not fully, but I’m optimistic. The upheaval of civil war often opens the door to democracy; mass uprisings are probably even more likely to lead to democracy than civil wars (perhaps even if they fail to topple the government); and peaceful protests have an even better track record than violence. Add that all up, and the prospects for at least some democratization start to look pretty good. I hesitate to make predictions, especially about the future (as Bohr, Twain, Berra, or possibly someone else put it). But if I had to do so, I would say that the Arab Spring will almost surely be a catalyst for democracy in the region. I’m curious: What explains your hesitancy to call Syria a civil war today (or even several months ago)?